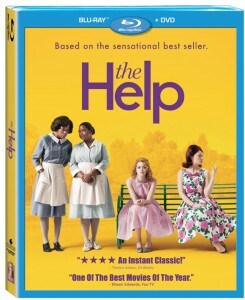 ‘The Help’ takes place during the turbulent times of the early 60’s in the center of the civil rights movement. Now a lot of these films that involve the subject matter of racial discrimination and the civil rights movement can get off track and be more of a political statement from the director rather than telling a good story. Sometimes it all just gets lost in the film. But with ‘The Help’, it is done with grace and executed almost to perfection. The story follows Eugenia “Skeeter” Phelan (Emma Stone), who is an inspiring writer who has a very liberal attitude. Sadly she was brought up and lives in a town full of small minded, ignorant, and mostly ditzy peers. The worst of the peers is Hilly Holbrook played by Bryce Dallas Howard who tries to lead her friends into even more discrimination against black people. She goes so far as to try to implement a law in her town that has homes install a “colored” separate bathroom for the help so that they won’t contaminate their own bathrooms. Skeeter is appalled by this and sets out to expose her small brained neighbors by interviewing the “colored” help for a magazine article. At first this seems to be a hard task to get willing participants to be interviewed about their trials in working for white families over the years. Skeeter finally gets two women to talk about their experiences, even though it might have negative consequences on their jobs and lives. Skeeter assures her subjects that she intends to expose how these maids work long hours for another family while their own family sometimes falls by the wayside and that she hopes after she writes the article/book that these women will finally get the respect they deserve. There are some great characters throughout the film and a wonderful story. The acting by everyone is top notch. Jessica Chastain is just wonderful in the film. My only gripe about the film was that it seemed to have a problem ending. I thought it was going to end at several occasions. This might be an editing problem, but by no means was i angry about this nor did it take away from the experience, but being a first time director and all, it just seemed to make the film drag on a little bit too long with out he film being slow. But that is such small fraction of what I really feel for the movie. I truly enjoyed the heck out of this movie. The video has a glorious 1080p transfer and is presented in 1.85:1. The picture is so amazing. There was no artifacting, noise or banding that I could see. The depth is breathtaking and full, and the colors are vibrant. The colors of the women’s dresses and the colors of the green lawns are superb and bright. The close-ups define great detail and wonderful textures. The blacks are deep and inky and the fleshtones are natural. An incredible video presentation. The audio has a great DTS-HD 5.1 mix that has a clear and crisp sound. The dialogue is presented clearly and crisp on the front speakers evenly and the ambient noises are distributed evenly on the entire system, such as bugs chirping and wind blowing. The score of the film is just right and does not drown out the dialogue at all. This is not an action film so there is not huge loud sound with bass that comes roaring through your house. It’s simply a pristine and perfect audio mix for this drama. Excellent audio presentation. Deleted Scenes (HD, 3 minutes) – Two deleted scenes with director intros. One is a comedic scene and one is an ending scene which was left on the cutting room floor due to it being a sad ending. Music Video: “The Living Proof” (HD, 3 minutes) – Mary J. Blige does a very passionate reading of the film’s anthem. WOW. Additional Deleted Scenes (HD, 7 minutes) – Three extra scenes to go with the two above that have random plot points and character development. Nothing really to see here. Featurette: “The Making of ‘The Help’: From Friendship to Film” (HD, 23 minutes) – This is more a feature with the director and the writer of the book who talk about the hardships of getting the book published and ultimately into a film. The cast chimes in with their views of the film and their relationships with the director. Interesting feature and very different. Featurette: “In Their Own Words: A Tribute to the Maids of Mississippi” (HD, 12 minutes) – A wonderful and classy feature that features several maids from the early 60’s who all talk with the director and one of the actresses from the film about their actual duties when they worked for families. This includes the director’s families maid from the time. Truly remarkable and passionate extra. I highly recommend this film on bluray. The extras are incredible although I would have loved to have listened to a commentary track, and the picture and sound are top notch. This film takes you on an emotional journey with some comedy throughout. Very light hearted overall, considering the subject matter. Disney did a great job with this release. Highly recommended. This entry was posted on Thursday, January 5th, 2012 at 8:48 pm	and is filed under Film. You can follow any responses to this entry through the RSS 2.0 feed. You can skip to the end and leave a response. Pinging is currently not allowed. « The CW Sets Its Sights on ‘Cult’ from ‘Farscape’ Producer, Which the WB Rejected Years Ago!! !